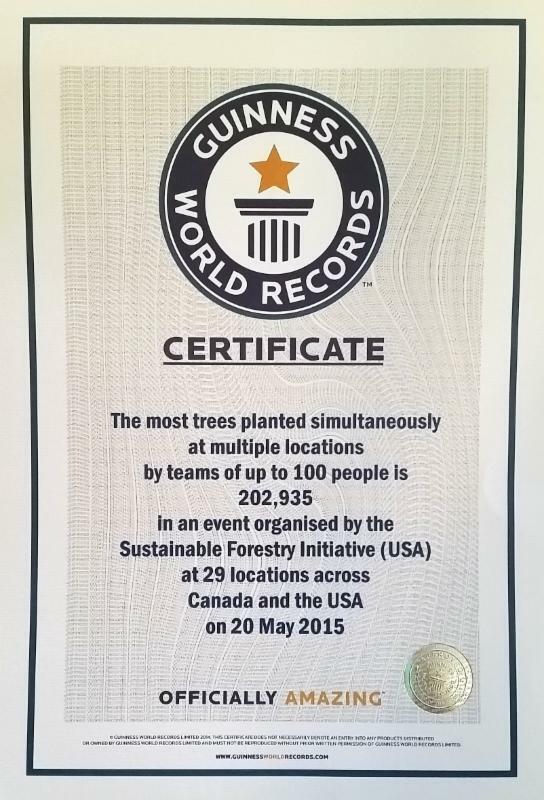 The Sustainable Forestry Initiative Inc. (SFI) and its partners across North America set a new GUINNESS WORLD RECORDS title, planting 202,935 trees in one hour. SFI partnered with 29 teams of 25-100 people each to plant trees in locations from New York City to Vancouver Island, British Columbia. “As SFI celebrates its 20th anniversary, I can’t think of a more exciting way to recognize and reinforce our commitment to healthy forests and sustainable communities, and to reaffirm that the actions we take today can have a significant and material impact on the future of our forests,” said Kathy Abusow, president and CEO of SFI. Organized by SFI, the effort involved 1,165 volunteers from all ages and backgrounds, including the forest sector, community organizations, youth groups, conservation groups and SFI Implementation Committees. They planted trees between 1 p.m. and 2 p.m. EDT on May 20, 2015. Watch a video capturing highlights of the record. When mature, these trees will provide clean air to breathe, clean water to drink and help improve the quality of life for many. 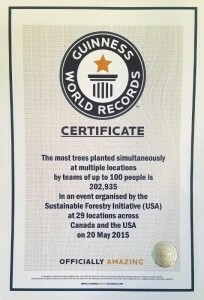 Teams that participated in the world record-breaking initiative included American Forests, Atco Wood Products, Baltimore City Recreation and Parks’ TreeBaltimore, City of Sumner, Washington, Coopérative Forestière des Hautes-Laurentides, Domtar, Fornebu Lumber Company, Interfor, Island Timberlands, J.D. Irving Limited, Massey-Vanier High School, Norbord Barwick (in conjunction with local schools), Norbord (Groupement forestier cooperatif Abitibi, Sylviculture La Vérendrye, Forêt d’enseignement et de recherche Harricana), New York Restoration Project, Parks & People Foundation, Pennsylvania Department of Conservation and Natural Resources, Pennsylvania SFI Implementation Committee, ReEnergy Holdings, Resolute Forest Products (the Haveman Team – Dog River Matawin Forest, the Outland Team – Black Spruce Forest, the Brinkman Team – Crossroute Forest), Minnesota SFI Implementation Committee, St. Louis County’s Land & Minerals Department, the Sugar Pine Foundation, TD Bank, Forests Ontario (with partners Michael’s Hair Body Mind and Credit Valley Conservation), UPM Blandin, and Williams Lake Plywood – West Fraser.